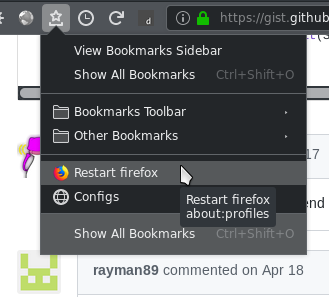 Restart Button for Firefox. An updated version of https://github.com/Endor8/userChrome.js/tree/master/restartfirefoxbutton_movable. Middle click also empties the script cache. I was not able to make the button work. It only appears as a button not on the menu and clicking it does nothing. Any idea why? One simple solution is to bookmark "about:profiles" ... when restart is needed open that page and click "normal restart"